Thank you for your kind words! 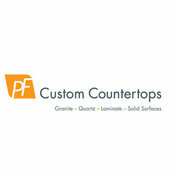 We are very pleased you are happy with your experience with PF Custom Countertops. If we can ever be of further service it would be our pleasure! Replacing our counter-tops was affordable and gave our kitchen a new look! Great job! We will be using your services again. Thank you. I'm very pleased you are happy with your experience with PF Custom Countertops, and I truly appreciate your recommendation for our company. Thanks for your purchase. Hi Andrea. We are pleased you are happy with the work we've done for you, and look forward to helping you with any future countertop needs. Thank you for your business!